I’ll be in San Francisco, CA, starting Sunday, April 14, 2019. I’ll plan to do a listener meetup. I’ve yet to plan where to shoot but you’re welcome to contact me through FB or email me at Brent@latitudephotographypodcast.com and as info becomes available I’ll keep you in the loop. I’m looking to stay within two hours’ drive of the airport. As I’ll be attending a conference I’ll also look to shoot closer in on Monday, Tuesday and Wednesday evenings as well. I can’t promise anything for those days, but Sunday afternoon is for sure happening. I’d love for you to consider joining me as we find someplace cool to shoot. And for a few more days I’ve got my latest gear giveaway going. All you have to do is share the show on your social media and send me a screen capture to my email brent@latitudephotographypodcast.com. 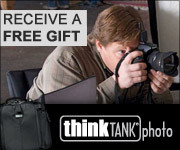 Do it by the end of the day on December 1, 2018 and you’ll be entered to win either an Exposure 13 black or FirstLight 20 by ThinkTank Photo. One entry per person please, must be a US resident 18 or older. Topic 1: Interview with Alyce Bender, travels around the globe. Alyce, Welcome to the show. Tell us a bit about yourself. Who you are, what you do, and as a photographer. There’s a few places that I certainly wouldn’t go now [North Korea] but who’s to say that in a few decades things might change (radically so for NK). Other things about the Faroe Islands. Van Living. You are embarking on a major road trip of sorts. Tell us your basic plans. How long will you plan to stay in any one area? Are there plans to get into Canada or Mexico? You’ll be at the Create photography retreat? Publish articles each month on location guides, monthly reviews on where I’ve gone.